As the San Francisco Giants continue their late season push for a playoff birth, the organization’s ace Madison Bumgarner already appears to be in postseason form. And if his performance this past Sunday against the Washington Nationals is any indication of things to come, the 6-foot-5 lefty is poised to help the Giants defend their World Series crown any way he can — and we’re not just talking about on the mound. Bumgarner took the ball on Sunday and essentially left the Nationals in his dust. His three-hit shutdown of the floundering NL East squad was a thing of beauty. 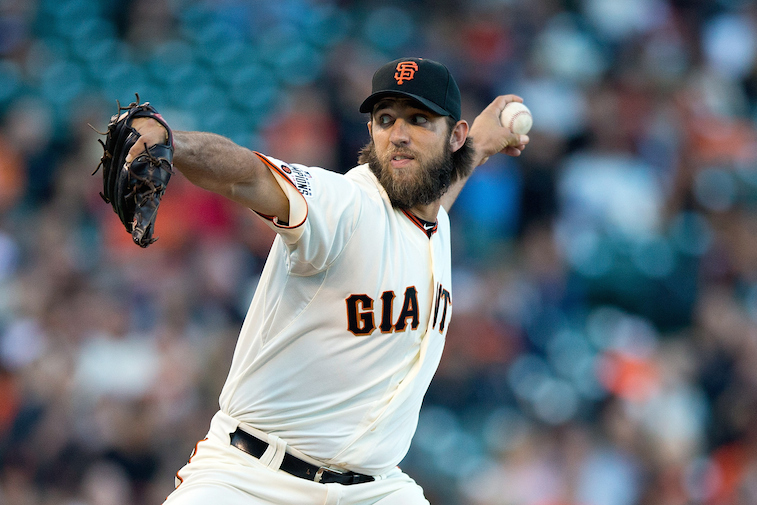 In notching his league-leading 14th win of the 2015 MLB season, Bumgarner only walked one batter, struck out 14, and propelled the Giants to a 5-0 victory. Oh, and for good measure, he also managed to hit a double and a home run. That’s some impressive stuff right there. On a day when the organization was honoring former great Juan Marichal, Giants manager Bruce Bochy couldn’t help but compare his No. 1 pitcher to the Hall of Fame legend. Bumgarner has a long way to go before he reaches Marichal status. However, if there is one area of his game where may already have upper hand, it’s at the plate. The long ball Bumgarner hit on Sunday, just so happened to be his fourth home run of the second — the second straight year he’s accomplished this feat. For a guy who doesn’t get paid for his skills with the bat, Mad Bum now has 10 jacks for his career. There’s not a whole lot of pitchers who can say that. Of course, while we can’t help but be amazed by Bumgarner’s prowess at the plate, he’s got some serious work to do if he was ever hoping to be compared to the great long ball hitting pitchers in Major League history. With that in mind, here’s a look at the five pitchers with the most career home runs ever. Earl Wilson (above right) may have only had one 20-plus win season during his 11 years in the big leagues, but somehow he managed to hit five or more homer runs in a single season on five separate occasions. So much for the notion that pitchers can’t hit the long ball. 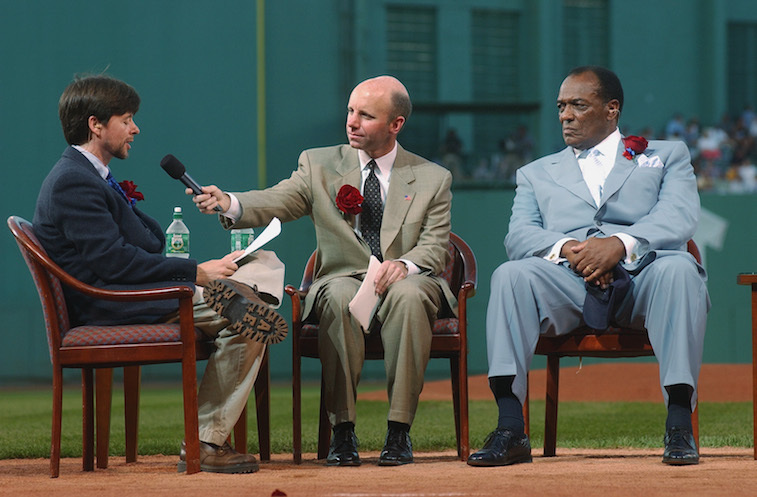 In 1966 — at 31 years of age — while playing for both the Boston Red Sox and Detroit Tigers, Wilson had 23 hits in 96 at-bats, including seven dingers. To prove this wasn’t a fluke, he would again go yard seven times during the 1968 season. By the time this 6-foot-3 hurler retired in 1970, his 33 career home runs would be the most by a single pitcher in the post-1960 expansion era. 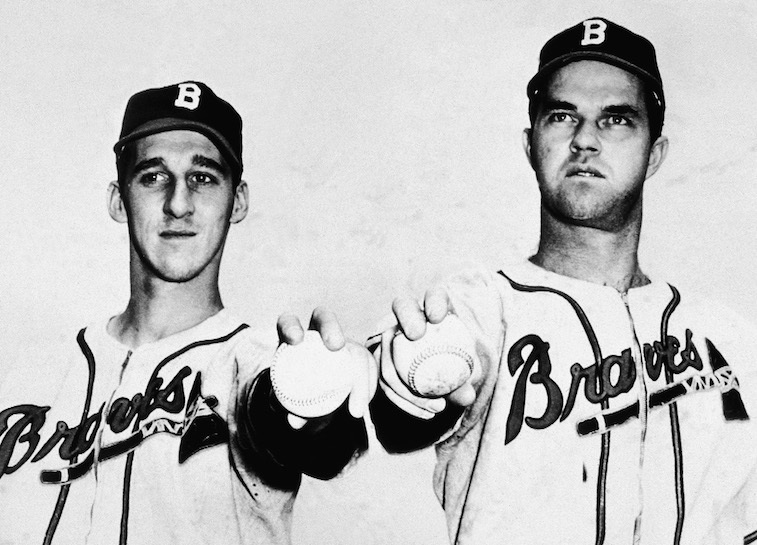 Hall of Famer Warren Spahn (above left) was first and foremost a pitcher. And an incredible pitcher at that. He was a 14-time All-Star, a Cy Young award winner — in 1957 — a three-time NL ERA leader and an eight-time NL wins leader. Spahn had 16 seasons of 15 or more wins and 13 seasons of 20 or more Ws. He was the real deal on the mound and someone who made life extremely difficult for opposing hitters. Of course, he didn’t exactly make it easy for the opposition when it was his turn to bat either. In 21 big-league seasons, Spahn went yard 35 times, good enough for No. on the all-time list. As he used to say, “Hitting is timing. Pitching is upsetting timing.” Clearly, Spahn was pretty good at both. Red Ruffing entered the Major Leagues as a 19-year-old kid suiting up for the Boston Red Sox, and calling it a career in 1942 at the ripe old age of 42. During those 22 seasons of pro ball, the 6-foot-1 righty ended up to leading the American League in losses (twice) and earned runs (twice) more times than he managed to lead the league in wins (once). Still, he did throw 190 strikeouts in 1932, compile a postseason ERA of 2.63, and help the New York Yankees win seven pennants. Clearly Ruffing knew what he was doing on the mount. Of course, this is about is about pitchers going yard. Ruffing did that as well, jacking four homers in a single season twice and finishing his career with 36 long balls in all. For his quality career, Ruffing would be inducted into the Baseball Hall of Fame in 1967. Bob Lemon didn’t enter the Major Leagues as a pitcher, but once he made the position change, the guy was absolutely lights out. He played in seven All-Star Games, led the AL in wins three times, he pitched the most innings in the American League on four separate occasions. But what made Lemon even more special, was that he was a beast from the plate. In fact, the seven homers he hit during the 1949 season, is still tied for the second most by any pitcher in a single year. By the time the Hall of Famer called it a career in 1958, his 37 career home runs would be good enough to sit alone at the No. 2 spot on the all-time home runs list for Major League pitchers. This was one Lemon you could rely on — just as the Cleveland Indians. Unlike some of the other players on this list, Wes Ferrell is not in Cooperstown. However, when it comes to the greatest home run-hitting pitchers in MLB history, the two-time All-Star is in a league of his own. Not only does Ferrell hold the record for the most homers ever hit by a pitcher in single season — he jacked nine in 1931 — but he also went yard seven times in both 1933 and 1935. With a grand total of 38 long balls, Ferrell was one hurler the opposition had to take seriously each and every time he stepped into the batter’s box. For a pitcher, that’s not a bad legacy to have. All statistics are courtesy of Baseball-Reference.com and ESPN.go.com.